The Natural and cultural heritage of the Ohrid Region comprises the ancient city of Ohrid and nearby Lake Ohrid, one of the deepest and oldest lakes in Europe. The city of Ohrid has been a cultural centre of great importance for the Balkan and the Slavonic language. Its churches are renowned for their frescoes and icons. 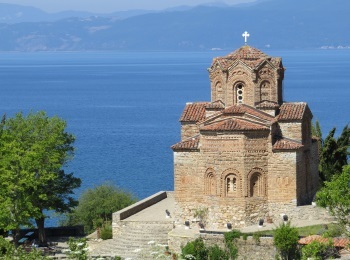 As an episcopal city, Ohrid was an important cultural center. Almost all surviving churches were built by the Byzantines and by the Bulgarians. The lake's water holds many endemic species of fish, molluscs etc. The lakeshore reed beds and wetlands provide critical habitat for hundreds of thousands of wintering water birds, including rare and threatened species such as the Dalmatian Pelican, Ferruginous Duck, Swan, Spotted Eagle, and Eastern Imperial Eagle. The “Natural and cultural heritage of the Ohrid Region” spans a large area in and around the Macedonian side of Lake Ohrid. The Republic of Macedonia owns about two-thirds of the lake, the remaining third is on Albania’s Tentative List as a transboundary extension. 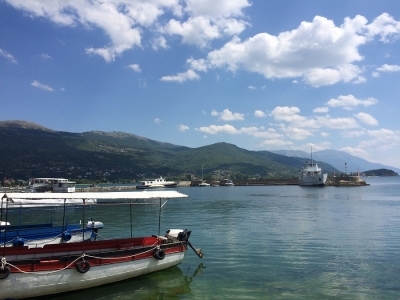 The site includes the lake, towns at the lake shore (such as Struga, Pestani, Trpejca and of course Ohrid itself), and also single monasteries like Sveti Stefan and Sveti Naum. And it encompasses a part of Galičica National Park - a protected natural area that covers the mountains surrounding the lake on the Macedonian side. I spent 3 nights in the town of Ohrid, and had 2 full days to explore. On my first day I ‘did’ the cultural circuit in Ohrid itself. First the short hike to the lovely Church of St. John at Kaneo. And then uphill to the archaeological site of Plaošnik. This was a big surprise: about half of the area is subject to archaeological survey or under construction for who knows what. The church of Saint Panteleimon itself is an ‘instoration’ – it was almost completely rebuilt (using the old materials) over the last years under the watchful eyes of ICOMOS. The result is too brand new to my taste, but it still is the most sacred place of the Macedonian Orthodox Church. The mosaics of the old basilica on the same grounds are worth a visit though. I did see many more churches, icons and related objects, but overall I found Ohrid a very sanitized and touristy town, I had expected something with more spirituality given the number of its churches. However it would be the perfect destination if you like to spend your holiday with Dutch pensioners: it’s very cheap, a week in a hotel including flights from Amsterdam and transfers can already be had for 250 EUR in the low season. You’ll also often encounter signs such as “Hier spreekt men Nederlands” (Dutch is spoken here) in restaurants and shops. On my second day I checked out the natural side to this WHS. I arranged for a taxi to bring me to the village of Elsani, about half way up the mountains above Lake Ohrid. From there, several hiking paths are possible through Galičica National Park. I choose the one descending to the coastal town of Pestani. It was a very enjoyable and relatively easy walk of 5.2 km. Only at the end I encountered two other hikers. The only slight problem is the signage, but fortunately I had read up before and learned that if you don’t see red-and-white stripes anymore for 50 metres, you’re on the wrong path. So I kept very focused on the stones and treetrunks mostly low to the ground. That way I was able to find a wild tortoise which I otherwise would have missed. After the hike I walked on along the coast for a km or 2 to see the ‘Museum on Water - Bay of the Bones’. Because, you’d never guess, Lake Ohrid had its prehistoric pile dwellers too! The reconstructed houses on a platform are based on the underwater site found nearby. This site is mentioned in the comparative analysis of the Alpine Pile Dwellings WHS, it says that they only recently have been evaluated by modern methods in underwater excavations and that they cannot yet be fully assessed. 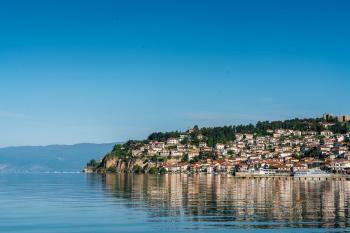 Ohrid is Macedonia’s only WHS to date, and probably its only full-blown tourist attraction. In total I spent 6 days in this small country, visiting also the statue frenzy of Skopje and the TWHS of Kokino. Somehow I did not warm up to it, I was missing the positive vibe of neighbouring Albania. Lake Ohrid is home to over 200 endemic species and is a critical habitat for migratory birds. As such, this is considered the most biologically diverse lake on earth. For this reason, Lake Ohrid was recognized as one of the first one hundred UNESCO World Heritage Sites. We were seriously disappointed that we didn’t have enough time to go scuba diving in the lake! However, we learned Lake Ohrid is recognized by UNESCO both for the environment, but also for the incredible cultural contributions of the region. As it turns out, the town of Ohrid on the banks of the lake is one of the oldest areas of human inhabitation in Europe (and the world). The town dates from the Bronze Age. In more recent times, this was an important Greek settlement and the ancient theatre here is one of the largest in the Greek world. It’s home to a popular summer music festival. The ‘Golden Age’ of Ohrid was the Tsar period and the fortress on the hill dates from this era (late 10th century). The highlight of our trip was the Byzantine churches and monasteries that line the shores. The iconic St. John of Kaneo is one of the most memorable buildings in the world. 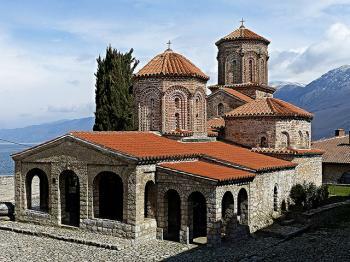 The church of St. Sophia in Ohrid and the nearby Monastery of Saint Naum complete the trifecta of incredible buildings. Lake Ohrid is the only UNESCO World Heritage Site in the Republic of Macedonia, but it is definitely one of the top places to visit in Macedonia. We would recommend Ohrid to fellow travelers. Ohrid is the largest lake in Macedonia and is located southern part of the country. The lake is shared with Albania, but the world heritage site portion is entirely within Macedonia. Ohrid is very easy to visit and is one of the most popular tourist destinations in Macedonia with plenty of hotels and restaurants in town. Most of the cultural and historic can be reached by walking to taxi in town, but if you want to explore the rest of the lake you should either go on a boat trip, or rent a car. Read more about the Natural and Cultural Heritage of the Ohrid Region on my website. I visited this mixed WHS in March 2016. There are only 28 mixed WHS on the list and I must say that they rarely disappoint. Lake Ohrid is FYROM's/Macedonia's only WHS and also its main tourist attraction. However, tourist crowds flock mainly in the summer months, so I was really surprised to be able to enjoy the main sites alone most of the time. I drove from Skopje to Lagadin which is a very straightforward journey and it's signposted well from the airport. The Unesco road sign is already proudly displayed almost 190km away! The lake management is quite rigorous and no water sports are allowed. Only boats allowed are a couple of fishing boats mainly used for sunset trips from Ohrid to Sveti Johan over at Kaneo or else 2 ferries from Ohrid to Sveti Naum. There are a few dodgy concrete lake resort structures which have been built too close to the shores and have reduced the reed beds surrounding the lake. However, there aren't any high structures and Ohrid's landscape is really lovely with the city walls high above and several churches to visit. Although practically all the lake towns are included in the inscription, all the main sites are around Ohrid proper and then there's a lovely monastery 29km away, just 4 km from the Albanian border, that shouldn't be missed. It has some of the best frescoes inside and it's still used as a place of worship today. It's a very tranquil place with peacocks roaming freely around. There is a barge restaurant which is great for a quick bite or to grab a cup of coffee. Near the restaurant, there are boat trips to the Naum Springs which are also part of the Galicica National Park. I went to Sveti Naum by car and I was able to visit the pile dwellings reconstruction on the way, the other lake towns and visit the Galicica National Park hiking trail to Velestovo on the way back. The other main sites are all in Ohrid. The best frescoes in my opinion are those at the Holy Mary Perybleptos Church, just near the ancient theatre before reaching the upper gate. The most photogenic church away from any modern construction is Sveti Johan which can be reached on foot from the harbour by walking on a wooden trail over Lake Ohrid. I went there at all times of the day, several times, and I must say that the colours at sunset with the church overlooking the lake are really worth the short hike. You can also get there by following a short trail from Plaosnik which goes through several pine trees. The old basilica and monastery dedicated to Saint Panteleimon is beautifully set nearby with several mosaics and excavations are still going on. However, a huge concrete 'university' is being built just next to it which in my opinion is quite an eyesore. The Church of St Sophia has some interesting frescoes too but the most interesting feature of the church is the inscription in the brickwork just under the eaves on the rear facade. This church was constructed in the 10th century and converted to a mosque during the Ottoman Period. All churches have separate entrance fees of around 2 euros each. St Naum also charges a parking fee of 1 euro for the day while the City of Ohrid charges 50c per hour for parking next to the harbour (07:30-01:30). The city of Ohrid is still alive and hasn't been turned into museum city despite having been inscribed several years ago. The locals are very friendly and the different religious and ethnic communities seem to get along quite well nowadays. I had a great time visiting this WHS and would gladly visit again in the future. If there are a few too many tourists in and around Ohrid, drive over the mountain road (with good views of both lakes) to Lake Prespa, rather wilder and much less developed but with some interesting villages (such as Brajcino and Maloviste) and churches (e.g. Kurbinovo) within easy reach. I have been to Ohrid many times and i must tell you it is the best place to be. It lake looks like dazzeling beads in the sun and the city reminds you of the olden days. Not all the city is old. Part of it has a new landscape to it. There are many beautiful churches there with millions of Byzantine-style icons. Trust me, you will love it if you go there! From "Ohrid Region with its Cultural and Historical Aspect and its Natural Environment" to "Natural and Cultural Heritage of the Ohrid Region"
to include the cultural and historical area. This site will carry the name "Ohrid region with its cultural and historical aspects and its natural environment". Ohrid even has its own airport, served by charter flights from The Netherlands, Switzerland, Belgium and Austria. There's a not so frequent local bus that connects all villages on the Macedonian side of the lake. Tombs: In the vicinity of the newly rebuilt monastery church of St. Kliment and Pantelejmon there is a tomb where Sinan (Jusuf) Chelebi was buried in 1493.
Notable Trees: The small cobblestone square near the market is dominated by a large plane tree (Platanus Orientalis), one of Ohrid's best loved landmarks. The tree is 800-900 years old. Its trunk is approximately 20m wide. It has become hollow and in the past has been home to a small barber's shop and a small café. Ottoman Empire: "In the late 14th century Ohrid fell to the Ottoman Empire. The Ottomans converted a number of churches and monasteries into mosques but tolerated the Ohrid Archiepiscopate"
Bulgarian Empire: Ohrid was the capital of the Bulgarian Empire between 990 and 1015. The city was conquered by the Bulgarians in 867. Via Egnatia: The Via Egnatia went round the northern side of Lake Ohrid, passing through the towns of Lychnidos (Ohrid) and Enchalon (Struga). Mosque: Ali Pasha Mosque built at the end of the 15th century or the beginning of the 16th century. The largest in Ohrid. Legends and Folk Myths: The existence of the ancient town of Lychnidos is linked to the Greek myth of the Phoenician prince Cadmus who, banished from Thebes, in Boetia, fled to the Enchelei and founded the town of Lychnidos on the shores of Lake Ohrid (Wiki). Mosques converted from churches , cathedrals or synagogues: During the time of Ottoman rule St. Clement's Monastery church at Plaosnik was transformed into the Imater Mosque. The mosque did not survive the end of the Ottoman Empire. Potential Transboundary sites: Albania has "Natural and Cultural Heritage of the Ohrid Region" on its T List. The T List entry makes no mention of a Trans-boundary extension and indicates the intention to include the lake and littoral up to the frontier (and hence the boundary of FYRM's existing inscription) - "Based on the biological and natural values the Albanian part of the lake Ohrid has been proclaimed as Protected Areas under the category V of IUCN."